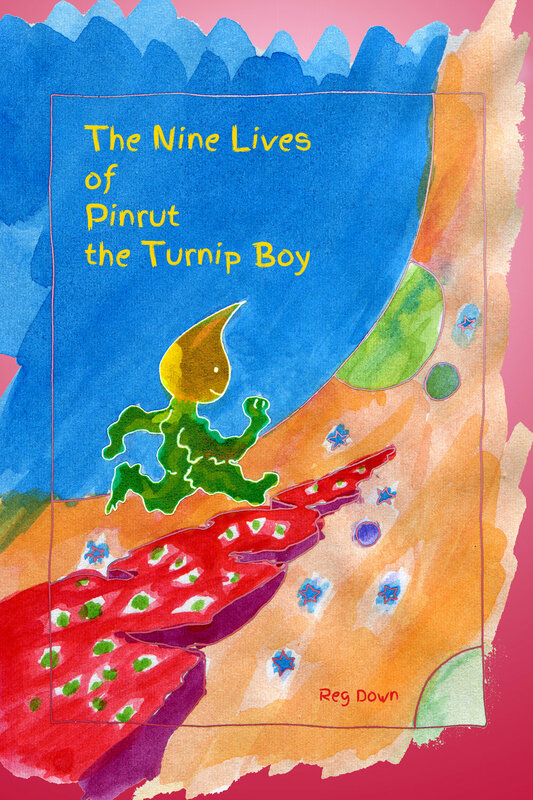 A synopsis of The Nine Lives of Pinrut the Turnip Boy by Reg Down. Includes age suitability, reviews, cover design and a link to sample chapters. This book began as a lark but kept on growing. Then teachers and parents contacted me to say their kids loved this slightly zany, fast-paced tale. His fans have been of mixed ages, too: grade 3, 4, 5, 6 - also the kids in a grade 8 were highly amused by him and inspired to write similar tales of their own as part of their writing block. There was once a turnip. He was an ordinary turnip, one you’d pass by without noticing. He grew in a row of turnips, one of many rows of turnips in a field that was one of many fields of turnips. That’s how ordinary this turnip was. Neither bigger, nor smaller, nor fatter, nor skinnier, nor longer, nor sweeter, nor more peppery: that’s how he was. And he had company, as you can imagine, for there were lots like him—thousands in fact. One summer’s evening this turnip up and left. He’d had enough. He pulled himself from the ground, turned upside down, and took off on his leafy stalks. He ambled along the row and out of the field. “Hey, you can’t do that!” cried the other turnips. “Watch me,” said the turnip. And watch him we will, through all nine lives: in America, Canada, China, New Zealand, New Guinea, Mars and Wobbles. Naturally he has a few adventures on the way, but his skills and savvy, indeed, his sheer existence, also come to the attention of the devilish boss of a nefarious GMO seed corporation called Nonsanto! Sample Lives: First Life, Second Life.